An adjective modifies a noun or a pronoun. To modify a word means to describe the word or to make its meaning more definite. 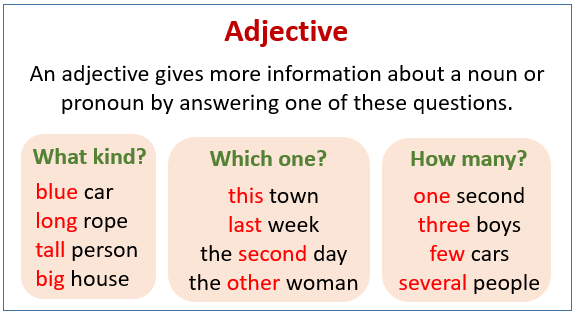 An adjective modifies a noun or a pronoun by answering one of these questions. What kind?, Which one? How many? The following table gives examples of adjectives that answers the questions, What kind?, Which one?, How many/How much? Scroll down the page for more examples and explanations. How are Nouns Used as Adjectives? Sometimes you will find nouns used as adjectives. The most frequently used adjectives are a, an and the. These little words are usually called articles. A and an are indefinite articles; they refer to one of a general group. A is used before words beginning with a consonant sound; an is used before words beginning with a vowel sound. Notice in the sentence, “He waited an hour.”, that an is used before a noun beginning with the consonant h, because the h in hour is not pronounced. Hour is pronounced as if it began with a vowel (like our). Remember that the sound of the noun, not the spelling, determines which indefinite article will be used. The is the definite article. It indicates that the noun refers to someone or something in particular. The hour for her departure finally arrived. The words my, your, his, her, its, our and their are considered pronouns in some books and adjectives in other books. They are called possessive adjectives and they come before a noun. The demonstrative adjectives this, these, that, those, and what are used as adjectives to modify nouns or noun phrases. An interrogative adjective (which or what) modifies a noun or noun phrase. An indefinite adjective modifies a noun, pronoun or noun phrases. Some examples of indefinite adjectives are: all, any, anyone, anything, each, everybody, everyone, everything, few, many, nobody, none, one, several, some, somebody, and someone. How to use Adjectives in Sentences? Usually, the adjective comes before the noun modified. Kate gave each child here hot tea and apple pie. The old, dusty book was found in her bag. Sometimes, adjectives follow the word they modify. Books, old and dusty, were found in her room. Other words may separate an adjective from the noun or pronoun modified. Shawn was not being rude. Courageous in battle, he deserved the award. "A," "an," and "the" are those tiny words we tend to forget about. They may sound simple, but there are Standard Edited American English rules of how to use these articles correctly. Watch the following video to learn about the articles "A," "an," and "the"
This video describes how adjectives are used in English. This is a basic explanation. The following video explains how to use comparative adjectives.